Last night I danced by the light of the blue moon and sang whatever song illumined my heart. Any day I have written and walked in the woods is a good day. Any day that sends me a sprinkling of synchronicity is one that sparkles. Yesterday was one of those good and sparkly days. I am contemplating the word “open.” It’s not my new word for 2010. It’s a 2009 spillover. Just because I turned the calendar page, doesn’t mean I’m done with the contemplations of 2009. My body, in its infinite though sometimes painful wisdom, is having me look again at this word “open,” by way of a very swollen tendon in my right-hand thumb pad. I did not do this in some noticeable way, like an accident. It just came on and the explanation is likely connected with some way I held the steering wheel during my long drive home. It’s painful. I type very slowly. It hurts to write with a pen. To hold or grasp anything with my right hand, I have to use the fingers only. It’s giving me a new appreciation for the evolution of the opposable thumb! The either /or of hold on – let go is a polarity that keeps me distracted with the game of it all rather than living life more freely. There is the baggage without and the baggage within that weighs me down, physically and psychically. In this contemplation it was about stuff, but in the bigger picture, it’s about life. It’s not the stuff in the boxes that weighs me down. It’s how I think about them. It’s not my past that holds me back, but the story I tell about it and this notion that I somehow have to be entirely free of the sadness and anger in order to feel alive and happy. It’s also some idea I have that if it crosses my mind at all, I didn’t really release it. I don’t have to do anything. I can do whatever I want: pick through it, let it go, give it away, sell it, never look at it again, let it rot, mold, be destroyed by mice. It’s not about letting go of the stuff. It’s about awareness of my fears; that there is one right or best way to handle it, that I will be letting things slip through my fingers, that I have to honor it, hold on to the lessons, understand everything about it, to release it and be complete. That’s precisely how having to let go makes letting go nearly impossible. I don’t have to permanently forget people and pain from the past. I don’t have to make them saints for the lessons I learned from them. I don’t have to do anything other than what I want, which is to accept it for what it is, and open wide to accept new people and new experiences into my life. If tears come through now and then, it doesn’t mean I’m not healed. It means I have an open heart and energy moves through and around an open heart. I want to hand-le life with an open heart! 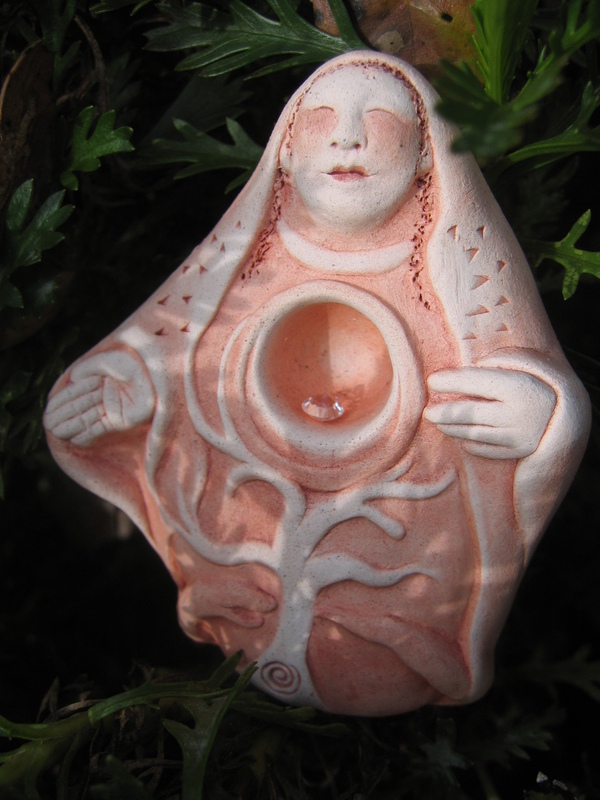 *you can get this and other lovely clay figurines from Bell Pine Art Farm. Interlude: Breathing is a cycle of inhale and exhale and that curious space of nothingness (no-thing-ness) in between. I use both my fingers and my thumb to grasp things. They are in opposition, like the poles of hold-on and let-go, and they work better together than alone. So, as I open to grasping, I grasp opening. Giving and receiving, I hold one hand turned outward and one hand facing me, and both are open. It’s becoming clear that the lesson for me here is in giving and receiving open handedly. I call this space “creative tension.” It’s where we are always at the edge of our frontier as creative, evolving beings and consciousness; where the drop knows it is the ocean and yet still the drop. It’s unfamiliar, edgy and completely natural. It’s a muscle we build, this willingness to be and live in the tension of the question. The friction ignites our creative embers. I want to warm and heal the way I handle life by the wisdom and courage of this fire. I want to use its light to illumine my way through the ever-unfolding Mystery. And, while I’m driving the distance, perhaps I don’t have to hold the steering wheel so tightly! Oh, and my new 2010 Spirit Cards (chosen during my New Year’s Day ritual)? I’m dancing with these to the music of Open.